I spotted this on the way to Tacoma Daily Index 'world headquarters' this morning . . .
That's 919 Pacific Avenue (next to Pita Pit). One less vacant storefront along Pacific Avenue. by morgan on 2/2/2010 @ 7:20am Good to hear/see you're still on the street Todd - it's been quiet around here! by Erik on 2/2/2010 @ 8:26am Yes, I saw this too. by Crenshaw Sepulveda on 2/2/2010 @ 11:13am It looks like downtown Tacoma may have turned the corner and is heading towards the golden age. 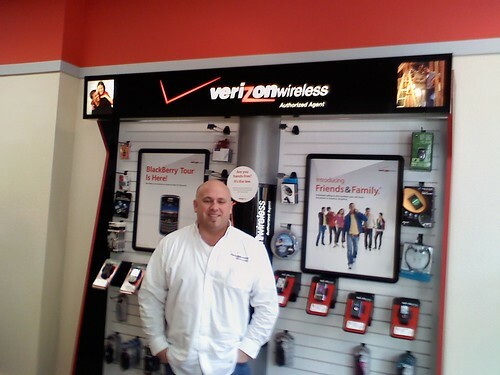 by Altered Chords on 2/2/2010 @ 11:45am Buzz Wireless - Kevin Rose is the guy to see about Verizon Wireless. No more take a number and wait and hour at the Verizon store near the mall. by Erik on 2/2/2010 @ 7:55pm Wait a sec. I thought this was a joke and the Verizon advertisement was just being used to paper the windows.